It is designed to increase the fire resistance of steel structures in normal indoor and outdoor environments. 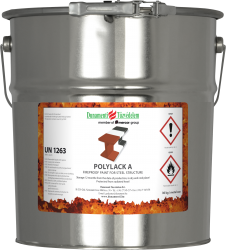 With the effect of fire – under the influence of heat – the Polylack A one-component fire protection coating foames, thus creating an insulating layer on the surface of the treated steel structure, which prevents this construction from overheating to a critical temperature and for a specified (desired) time. For indoor applications, with relative air humidity max. 80%, no topcoat required. Thanks to its solvent base, it can be applied even at low air temperatures (up to -5 ° C). After drying to a certain extent, it can withstand the weather, so it is possible to mount the treated steel structures outdoors without using a top coat.